The AWEX EMI closed on 1979c – down 29c at auction sales in Australia this week. The 1.4% weekly fall attracted a 12.5% pass in rate from the 40,785 bale offering, with a heavy passed in weighting in the crossbred lots across the nation and overall % Southern and Western markets. It was the 3rd successive week where the EMI has posted small falls which is an attribute to the increasing volume of poor quality lots. South African markets lost a further 3.5% for the week, as the Chinese ban on SA imports continues to erode their wool markets prices, and no doubt this is having an impact on the price for Australian Wool. Merino Fleece saw the best style and measured lots attract losses of 15-20c, whilst the expanding poorer style and lots with poor specification lost 30-50c. Merino Skirtings looked to have a reasonable week but as the lower style fleece prices converge to meet the skirting prices, I think there will be some adjustment coming. Crossbreds broke their dream bull run with a correction of 10-40c with the coarser MPG’s least affected. Carding wools were able to maintain their levels of last week in Sydney however Melbourne fell by 8c and Fremantle fell a whopping 45c. 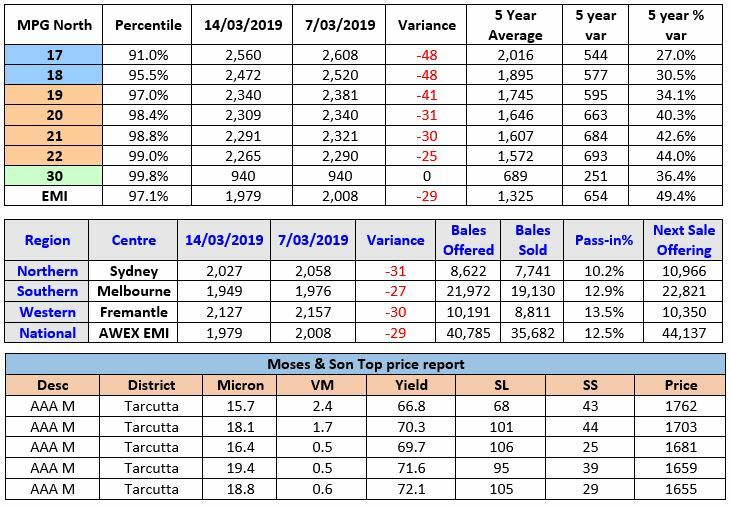 Forward Price Report from Michael Avery (Southern Aurora Wool): Expectations of a lower spot auction came to pass as the market drifted down for the third consecutive week. Demand has waned as topmakers continue for be unable to pass the current price structure down the pipeline. The forward market levels remained relatively stable out into spring with trading levels only slightly off. 19.0 microns traded 2225 and 21.0 microns traded September at 2130 and October at 2115. These prices represent the 80th percentile for the last 4 years giving growers a solid base into the new season and delivering some confidence for the processors. Exporters also are disinclined to sell the current market short at discount levels that processors demand without any cover. The opportunity is ripe for growers for be price makers not price takers. Levels need to be set with short, medium and long term goals based around production costs, margin management and historical price structures. We anticipate the market will continue to drift but look to find a level. Retraction during this last part of this upward cycle have been in the order of 100 to 150 cents before finding a new base. The market in the fine and medium merinos has risen 200 cents since the New Year and given up 40 percent of that rally to date. Chartist have the spot market losing a further 40 cents before looking for relief.